EngagingBirth: What Would It Feel Like, If....? What Would It Feel Like, If....? 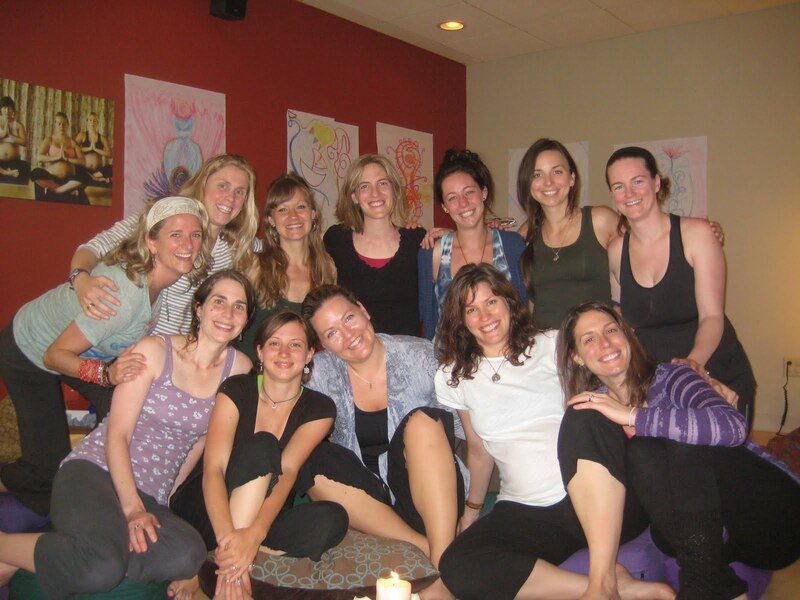 This weekend I went to a Prenatal Yoga Teacher Training Workshop through Blooma- one of only seven Yoga Alliance registered prenatal yoga teacher training programs in the US. I was a little apprehensive at first, coming from a doula/childbirth educator background with no previous training in yoga instruction, but my ten years of personal practice and Blooma’s great instructors proved to be sufficient. The weekend training began with a group building exercise: we sat in a circle, listening to Kirtan, and took turns lighting candles while introducing ourselves and sharing what brought us to Blooma. It was a little new-agey for me (I promise, I have been to Amritsar several times and listened to Kirtan at the Golden Temple, so it’s nothing against Kirtan itself- which obviously has a different organic feel when you are sitting around the Guru Granth Sahib- this just felt strange in Edina, MN). While I tried to keep an open mind, it was like tasting a new food for the first time- different and strange- but not unpleasant; in fact, the more I tasted it, the more comfortable I got and even, dare I say, liked it. 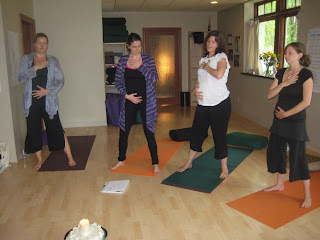 The next day we joined the pregnant mother’s for the morning yoga class. The instructor used some fairly strong descriptive words to create imagery during the class, words like: juicy, luscious, soft, warm, mushy, open…but one phrase that really stuck out to me was this one: “What would it feel like...to allow your hips to explore a larger space around you? What would it feel like…to move that softness to your shoulders? What would it feel like…to breathe into your heart in this position?” WHAT WOULD IT FEEL LIKE…? This phrase opened all sorts of possibilities for me. The next day as we were in goddess pose, we started to shake our hands-sort of the way you would if your hand fell asleep and you were trying to get your circulation going again. The instructor prompted something like this…”close your eyes if you want…bring attention to your hips and your shoulders…what do they want to add to this pose? What would it feel like, if you tuned into that movement?” So I did. I turned into myself, explored my own organic movements and dance in that pose (mind you, I am still holding goddess pose- so my thighs are burning!) But this somewhat reserved Midwestern white girl found herself dancing (I totally might have looked like Elaine J…but who knows). The important thing is that I felt free, open, joyous, and empowered. I stopped worrying about what I looked like, and I was laughing. Yoga moved beyond challenge and rejuvenation…it became fun! It was an experience that taught me that I don’t have to respond to situations the same way I always have. I can live outside my self-created box and find strength and freedom from exploring other ways of being. So that night, my new self-discovery was put to the test. I am sleeping with three of my kids in the same room with me right now (since I am traveling without my husband) and two of them sleep in my king bed with me. My youngest is getting over a cold and jet lag, and that night she decided to put on her thick footy PJs. In the middle of the night, her coughing wakes her up enough that she starts to cry. She’s arching her back and flailing around with discomfort. I’m trying to get her to drink some water, I unzip the top of her PJs to give her some air, and though she keeps pushing me away in her half-conscious state, I am trying to hold and comfort her. Nothing is working. I am tired after a long day of yoga and my own jet lag, and I know I have to get up early the next morning…my patience and compassion are unfortunately limited. Soon, I find myself trying such lame attempts as threatening: “Mehrsa,” I explain, “you need to stop coughing and crying because you are going to wake everyone up. I’m going to have to find someplace for you to sleep where no one can hear you.” OK- this was desperate- and unrealistic, since there is no place for me to bring her in the house where no one can hear her- not to mention mean. Fortunately for me, she is not very conscious and just continues to flail and cry pathetically. So, I stand up next to the bed and take a deep breath. “What would it feel like if…I were to respond differently to this situation? What would it feel like if I were driven by more compassion rather than my fear of not getting enough sleep?” After a few moments of internal exploration, an idea pops into my head. I unzip the pajamas all together and take them off. Now she is just lying next to me in her pull-up. As her skin touches mine, I feel her melt into me. She snuggles halfway on top of my body, nuzzles her face into my chest and crawls her little toes in between my legs. The tension and even coughing leaves her body, and she settles down into a deep relaxed sleep, and pretty soon, so do I. I spent the rest of the next day feeling a renewed surge of love for my little one and remorse for initially overlooking her needs because I was so consumed by my own. I move forward in life, knowing that as stressful situations arise…as they will…I can search deep inside me and find whatever it is I need to help me through. I am not controlled by fear, I am motivated by love. In yoga, we practice positions of strength and endurance, and yet at the same time, allow our bodies the freedom to explore all sorts of different movements. Through the mind-body connection that exists, that same possibility for strength and freedom is passed onto our minds- preparing mothers for the most physically and emotionally challenging experience of their lives. But the good thing is…they don’t have to respond from a position of fear. They have endless possibilities, as they mindfully acknowledge each new sensation, and consider: "What would it feel like if...?"